This story was updated Aug. 30 to include the final ballot wording for the Voters Not Politicians proposal and details of the Board of State Canvassers meeting. Language for an initiative that would change the way Michigan draws voting district lines was approved this week, representing a middle ground to the competing drafts of the proposal’s opponents and supporters. The language is particularly important for the hefty, eight-page redistricting proposal, that survived a fraught legal battle over whether it is too sweeping and complex for the November ballot. The wording, crafted by the Bureau of Elections, attempts to distill the Voters Not Politicians proposal down to just the 100 words voters will see on election day. The Board of State Canvassers reviewed and voted on the language during a meeting in Lansing Thursday after taking public comment. The final language will be identical to what Elections Director Sally Williams proposed, with one addition: to describe it as a "commission of citizens" in the descriptive header. 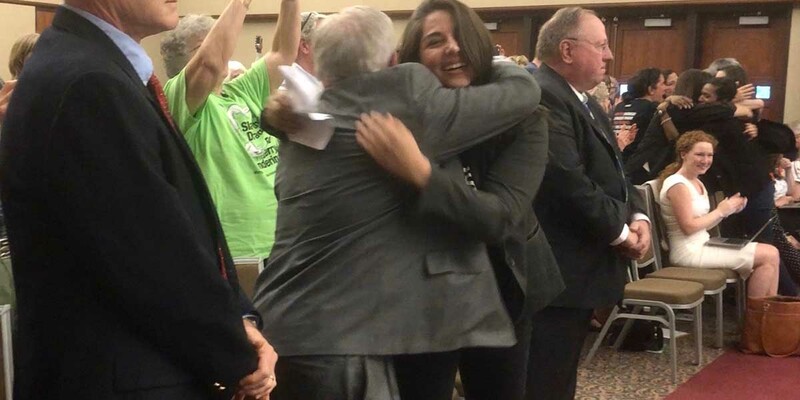 Two Republican and one Democratic member of the board voted to approve it, while one Democratic member voted against approving it, arguing that it leaves out important information about the proposal such as mention of the Voting Rights Act. The language was approved after two hours of debate. Voters Not Politicians' lawyer and director sought to include mention of the commissions' transparency, public hearings and use of existing federal standards to protect minorities' vote. Opposition group Protect My Vote, represented by attorney Jason Hanselman, asked the state include note of the commission's cost and "ought to discuss the millions of people who are automatically disqualified" from serving on the commission. Board members were divided along party lines — Republican board members favored approving the state's proposed language while Democratic board members favored many of the changes sought by Voters Not Politicians. "I think it's a minor win. I think unfortuantely there were still major aspects of how we intentionally crafted the language... that were left out," said Voters Not Politicians Director Katie Fahey, later adding, "I don't feel like we've been as treated as partisan as we have today." Tony Daunt, executive director of Michigan Freedom Fund, opposes the initiative. He said Williams' language "came down the middle" of what both sides asked for, despite Democratic board members "really getting greedy and trying to push this thing from the proponents angle." Both supporters and opponents of the VNP proposal submitted suggestions to state elections officials earlier this month for how the measure should be described on the November ticket. The proposed wording from Voters Not Politicians focused on the broad strokes of what the proposal would do — take redistricting power from legislators and give it to an independent, politically balanced commission of citizens — in lieu of details about how the commission would work or be chosen. Eric Doster, one of the attorneys who fought to keep the proposal off the ballot, submitted alternative language that describes the ballot measure as a “majority partisan commission” because eight of the 13 commissioners would be self-identified partisans (four from both major parties). It primarily focuses on the mechanics of how the ballot initiative would work and eschews both Doster’s suggestion to use “majority partisan” and Voters Not Politicians’ suggestion that Williams use the word “independent” and give “substantial weight” to the purpose of the initiative, which is to prevent partisan gerrymandering. Williams’ language mentions that an appropriation of state funds would be required, which VNP’s language avoided. But it also doesn’t include Doster’s proposal that the initiative would “mandate that a minimum of $5 million of taxpayer funds be spent” on it. The proposal would in fact require a quarter of the Secretary of State’s budget be allocated for the commission and doesn’t specify dollar figure; if appropriated this year it would receive $4.6 million. Opponents of the initiative say they fear it is a thinly-veiled attempt by Democrats to gerrymander in their favor with little accountability to the public and legislators. Proponents counter that the proposal is a transparency-focused method for remedying the state’s existing gerrymandered districts, which were drawn by Republicans in 2011 with the financial backing of the Michigan Chamber of Commerce and others. Mr. Grynaviski misses the point. The commission is "independent" of politicians. And any commission decision will need the votes of at least two members of each of the three groups, so there is no tie-breaking function by anybody. David Waymire has summarized the intentional misinterpretation of "independent" perfectly. These guys could have worked for Pravda. With the caveat that I don't agree with your characterizations, that's how he earns his living, Matt. He owns a company specializing in "strategic communications." I'm not sure if VNP is a client, but the principals are appearing at a VNP fundraiser in Lansing. The company is damned good at what it does. I like what the board approved. It's a commission--neither independent nor partisan. I would, if I had my druthers, strike "...reflecting Michigan’s diverse population and communities of interest." That's about the only phrase in it that isn't wholly expository. If Proposal 2 is passed, millions of Michiganders will GAIN the ability to participate in the redistricting process. Under the present system (controlled by the majority party in Lansing) the only people who have any input into the way maps are drawn are a small circle of political insiders, lobbyists, and special interests, who do NOT have to disclose how and why they choose certain maps, or how much taxpayer dollars are being spent on their shenanigans---indeed, our legislators have declared that they are exempt from FOIA. Whatever party controls the legislature in 2020 will play this game---no party's hands are clean. By contrast, Proposal 2 establishes a commission that is required to hold 10 public hearings before the maps are even drawn, and another 5 public hearings before any final decision is made. The commission will be subject to the Open Meetings Act, so all deliberations are open to the public, and all the data and computer programs used to draw the maps must be made public. No maps may be adopted unless they are accepted by 2 Democrat, 2 Republican, and 2 "unaffiliated" members of the Commission. And everyone will know WHO is making the decisions, HOW they are making the decisions, and WHY they are making the decisions. But the Protectors of the Status Quo continue to perversely bray that the proposed commission would limit citizen participation. Are they sincerely concerned about empowering the people of Michigan? Or do they just want to protect their power to gerrymander? Exactly right, Yi-Li! Michigan is one of the 3 worst gerrymandered states because of the backroom dealings of the majority party, in this case, Republicans. Their work against Proposal 2 is nothing but a naked power grab, one at which they will be glad they failed when this passes in November and a blue tsunami washes them out of power. For Republicans, losing is winning on this one, they just haven't realized it yet. Still waiting for the detailed explanation of how a commission that statistically will lean democrat (and heavily reliant upon outside assistance in order to formulate district maps), will be any more effective in preventing partisan gerrymandering than the current system? Kevin, if you can find something in the proposal that supports your concerns, please appoint it out to us.